In 2015, grassroots advocates in Washington crafted a carbon tax ballot measure that, they hoped, would make theirs the first U.S. state with a carbon tax. Their Initiative 732 would have established a comprehensive statewide carbon tax reaching $25 per metric ton of CO2 in 2018 and rising thereafter at 3.5% faster than the general inflation rate. The initiative was decisively defeated, however, by a vote of 59% to 41%. We discuss I-732 and the divisiveness it spawned, directly below. Washington Gov. Inslee’s just-proposed (Dec. 2016) carbon tax would dedicate a majority of revenue to funding education. Five weeks after that vote, Washington Gov. Jay Inslee proposed a carbon tax whose level — starting in May 2018 at $25 per metric ton of CO2 and increasing thereafter at 3.5% a year faster than inflation — would be identical to that in I-732. The Seattle Times first reported the proposal, which is a key part of the governor’s fiscal plan, on Dec. 13. Inslee’s office has issued an informative 3-page policy brief outlining the intended uses of the carbon tax revenues; unlike I-732, which was designed to be nearly 100 percent revenue-neutral, the governor’s proposal, which requires legislative approval, is intended to patch big holes in the state budget. We hope to report on the progress of Gov. Inslee’s proposal shortly. CarbonWA says it is thinking through next steps and want[s] to hear supporters’ “thoughts on the election and where this movement that you helped build should go next.” The group invites feedback via email. Their terrific Web site, Yes on 732, is still up. Seattle Times graphic, downloaded Nov. 11. Earlier reports had the vote slightly closer. Official Nov. 13 update (see text) has same percentages. As of Nov. 13, Washington’s Secretary of State was reporting 1,571,080 No votes vs. 1,091,626 Yes, a nearly 3-to-2 margin. Only King County, the state’s largest, which includes Seattle, voted majority Yes; all other 38 counties voted No to Measure 732. In the aftermath of the election, the Alliance for Jobs and Clean Energy — the Washington confederation that became the locus of “green” opposition to I-732 — posted a five-page draft clean energy plan intended to fulfill its commitment to fashion an alternative policy to Carbon WA’s revenue-neutral carbon tax. The plan’s carbon tax, just $15 per ton of CO2 and with no increase beyond inflation unless as-yet-unspecified reduction targets are met, would be around half of the tax level specified in I-732; most emission reductions would come from investments in efficiency and renewables outlined but not specified in the draft. Alliance leaders pledged to push their plan to the legislature and vowed to put it on the ballot in 2017, if necessary, the Seattle Times reported on Nov. 12. The I-732 referendum received intense national as well as local coverage in the run-up to the election, in part because the split over the measure within the green movement made for a compelling (and disturbing story). 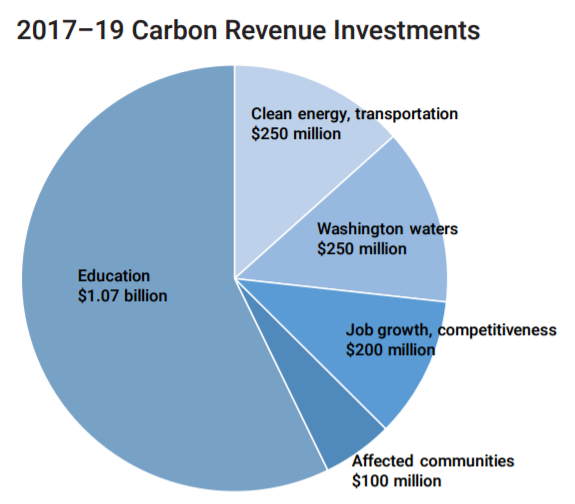 Opposition to Washington’s historic carbon tax initiative is coming from the unlikeliest of sources (Natasha Gelling in Think Progress, Oct 6). Sophisticated and concise examination of the green split over I-732. Initiative 732: A ‘Carbon Tax Swap’ To Address Climate Change (Seattle NPR affiliate KNKX-FM, Oct 3). Excellent account of both sides’ views on I-732. The environmental groups killing a carbon tax (“The Hill,” Sept 22). Professor of law and economics Shi-Ling Hsu — a signatory to CTC’s Paris letter last fall — dissected the opposition to I-732 from sectarian green groups. Tax carbon polluters, not working families (“Crosscut,” Sept 20). Three veteran organizers explained why the I-732 carbon tax will be just as well as efficient. 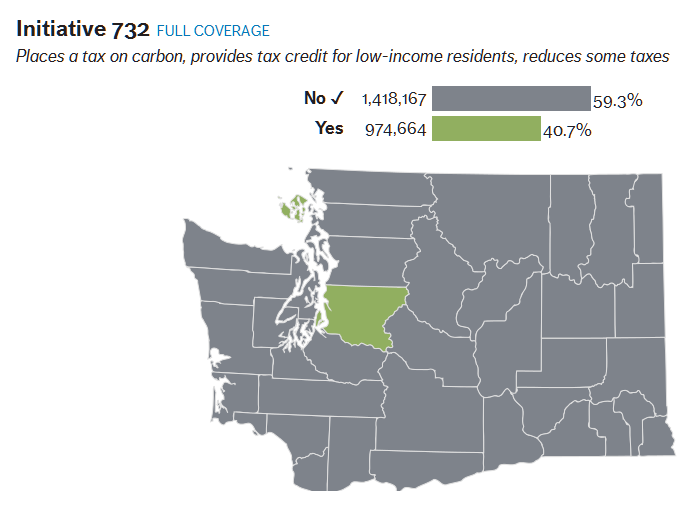 Washington Carbon Tax Ballot Initiative Picks Up Biggest Corroboration Yet (CTC blog, Aug 5). Our quick guide to Sightline Institute’s in-depth analyses backing Carbon-WA’s claims for Measure 732 demonstrating that the carbon tax will be revenue-neutral, income-progressive and climate-effective. There’s a cheap, proven fix to the world’s biggest problem (CNN, April 19). Political writer John Sutter interviewed Carbon-WA founder Yoram Bauman and explained why a victory for Yes on 732 could be key to unlocking carbon taxing in the U.S. The Carbon Tax Center strongly supported Carbon WA’s initiative and organizing campaign. Our blog posts during the few weeks before the election responded vigorously to attacks on Initiative 732. Earlier-dated posts mostly involved straight reportage about the merits of the initiative and the campaign to pass it. Washington State’s I-732: A Climate Measure for the Society We Have, Oct. 18, 2016. Invokes mid-century humanist radical Paul Goodman to critique “old-guard” green-establishment’s stance opposing Carbon Washington’s ballot initiative. The Political Meltdown That Could Save The Climate, Oct. 8, 2016. Why the GOP-Trump electoral meltdown opens a path for I-732 to become the template for a U.S. carbon tax. Carbon Tax Can Be a Remedy for Toxic Hot Spots (Sept. 13, 2016). Rebuts notion — left over from the 2009 Waxman-Markey bill built around cap-and-trade with offsets — that a carbon tax could perpetuate or exacerbate tosic “hot spots” in communities of color. Washington Carbon Tax Ballot Initiative Picks Up Biggest Corroboration Yet, Aug. 5, 2016. Reports on masterly rebuttal to WA state government’s objections to I-732, from Pacific NW think tank extraordinaire Sightline Institute. Feeling The Heat: A Carbon Tax Gains Grassroots Momentum in Washington State, July 16, 2015. CTC’s Matt Gordon captures the on-the-ground energy of Carbon WA’s petition-gathering for Initiative 732. The Evergreen State is blessed with abundant natural beauty — Mt. Rainier, the North Cascades, Puget Sound, the Olympic Peninsula and the Columbia River basin and gorge — with an outdoor culture to match. It was also wracked by drought and forest fires in 2015. In that year, carbon tax advocates under the banner of Carbon Washington began organizing for a ballot initiative mandating a state carbon tax. Measure I-732 would have taxed carbon emissions at an initial rate of $15 per ton of CO2, rising the following year to $25 per ton, and then increasing annually by 3.5% more than the inflation rate. Graphic from http://yeson732.org/ highlights the tax benefits. The tax, gracefully summarized last year by the Christian Science Monitor, would have used the expected $1.7 billion in annual revenue to overhaul Washington’s unusually regressive tax code. Most of the money was earmarked to lower the state sales tax from 6.5% to 5.5%. (While the state sales tax is 6.5%, the average combined local-state sales tax rate is 8.89%, the fifth highest in the country.) The annual increases in the carbon tax would have offset the rising value of the sales tax reduction, ensuring the measure stayed revenue-neutral. Another $200 million a year would have funded the state Working Families Rebate – an extension of the federal Earned Income Tax Credit. The Working Families Rebate was created in 2008 but never funded, and revenue from the carbon tax could have assisted 400,000 low-income working families. These two pieces made I-732 the state’s most progressive tax initiative since groceries were exempted from sales taxes in 1977. The remaining funds would have enabled the state to eliminate the business and occupation tax on manufacturing — a feature designed to win business support. CTC researcher Matt Gordon visited Washington in June 2015 and met with ballot organizers there. He wrote a blog for us about Measure I-732 last July and another in August about backbiting against Measure I-732 by some veteran state environmental advocates. (The surprising opposition to I-732 was criticized by leading right-of-center economist Greg Mankiw in a New York Times opinion piece in early September, 2015, backing the measure.) Despite the opposition, Carbon Washington collected 360,000 petition signatures — over 100,000 more than the 246,000 required to put Measure I-732 on the November, 2016 ballot for a statewide up-or-down vote. Keibun Mori, a former economist with the Washington State Energy Office, developed a carbon-tax spreadsheet model to predict revenue generation and CO2 reductions for the state from a carbon tax. Keibun’s model used an elasticity-based approach (as does CTC’s national carbon-tax model), and was used to estimate greenhouse-gas emission reductions for the Oregon study noted above. Carbon Washington’s I-732 website has clear and compelling information, arguments and graphics for Measure I-732, including lead organizer Yoram Bauman’s clarion defense of the measure’s provisions to ensure social and economic justice. Yoram’s New Year’s 2016 update was stirring and informative as well.